After Santa crashes his sleigh and loses his reindeer, he is arrested trying to steal his reindeer back from the local animal shelter. Now, it is up to an ex-con and his son to save Christmas by breaking Santa out of prison. Well, it looks like Christmas needs to be saved once again. Whether it be Scott Calvin, Buddy the Elf, or Ernest P. Worrell, Christmas sure needs a lot of saving. This time, it is up to an ex-con named Steve and his son, played by Rafe Spall and Kit Conner. "Get Santa" is written and directed by Christopher Smith, who is more known for directing R-rated horrors and dramas than family films. When Santa, played by Jim Broadbent, crashes his sleigh and loses his reindeer, he goes to get help from Steve because Steve saw him once as a child. Random. Steve blows him off at first, but after Santa winds up in prison trying to steal his impounded deer back from an animal shelter, Steve finally decides to help after his son insists on it. So, what else is there to do? They must break Santa out of prison. You would think that Santa would have had an opportunity to post bail, but we guess that wouldn't be much of a movie now would it? 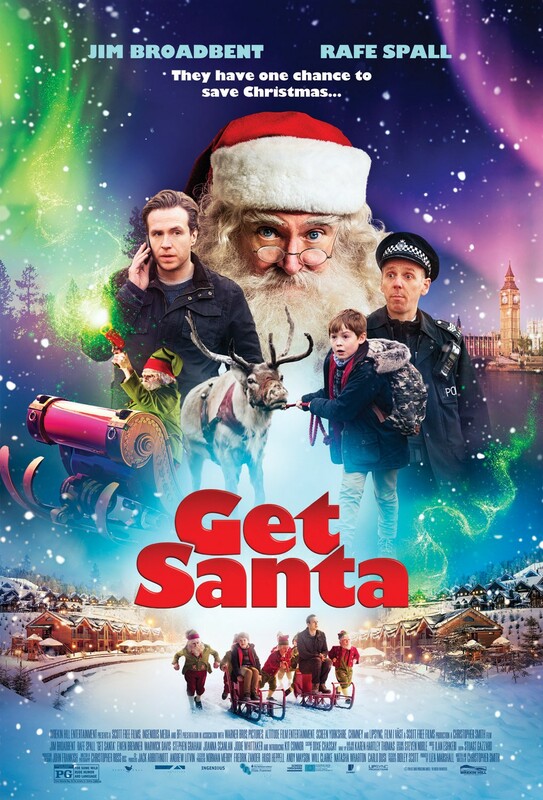 "Get Santa" is an entirely formulaic family Christmas comedy. It is a very disposable holiday film that has just a bit a silliness and not much else. It will be quickly forgotten by all who watch it. Some of the jokes in this film do work well within the context of the story, mainly those involving dry and witty one-liners and a few situational moments. The rest of the humor consists of the typical toilet humor that will appeal to the children in the crowd such as reindeer who communicate through farts and Santa fighting off the police by shooting a machine gun that shoots reindeer poop at them. "Get Santa" also seems to borrow a couple jokes from a few of the more well known Christmas comedies. The film has a good cast and the acting is serviceable. Unfortunately, the story doesn't really make a whole heck of a lot of sense and the narrative seems a bit all over the place. The pacing certainly drags at some points, and though this movie isn't very long, it could have certainly been shorter by cutting out a bit of filler (maybe five or six less farting reindeer jokes?). In the end, there are many better holiday films out there, and you may be better off re-watching one of those instead of subjecting yourself to a low-level family flick like "Get Santa."